We offer several styles of contemporary architrave that perfectly compliment a modern interior design scheme. Architrave with a simple design is hugely popular right now- especially those profiles that feature a groove. 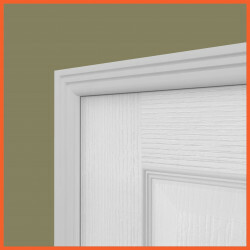 In the past, architrave would be slightly thicker than the skirting board in order to mask any imperfections where the two mouldings come together. However, the modern look is to have the architrave the same thickness as the skirting board. By opting for a grooved architrave at the same thickness as the skirting, it is possible to align the grooves so that it forms one continuous line from the skirting around the door- a look that is currently very popular in contemporary interiors. One advantage of ordering a less detailed architrave design is that it can be cut thinner than the standard 70mm. We now offer many of our more modern architrave styles in 50mm and 60mm, which again is something that is becoming more prominent in contemporary interior design. As with skirting boards of a similar style, there has been a rapid increase in the number of requests to have architrave painted in other RAL colours than the traditional white. If you have a specific colour you require, please get in touch with our sales team to arrange this. Our Edge 2 architrave (sometimes referred to as ‘scotia’) is a bold architrave that is perfect for modern interiors. 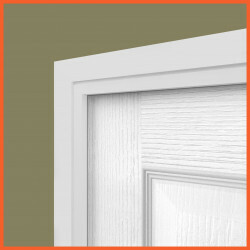 The Edge 2 architrave is very minimal in its styling, and is particularly popular in the thinner widths of 50mm-60mm. The single internal curve moulded into the architrave makes for a more visually interesting alternative to a bevelled edge.